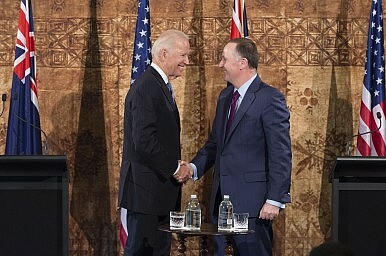 Vice President Joe Biden’s visit to Auckland represents an end to 30 years of security estrangement. The visit of a U.S. Navy warship to New Zealand in November will mark the close of a 30 year period of security estrangement between two democratic nations. Announced during Vice President Joe Biden’s visit last week to Auckland, the change signals a final thaw in the anachronistic frostiness between Washington and Wellington. It also represents an opportunity for the United States to deepen cooperation with New Zealand, which is today engaged in its own brand of quiet ambition in the Pacific and further afield. Biden, whose visit would once have been unremarkable, is the senior-most American official to visit New Zealand in 17 years. The breach in bilateral ties dates to 1984 when, amid rising anti-nuclear sentiment, newly elected prime minister David Lange banned port visits by any nuclear-armed or powered vessels, American included. Given the U.S. military’s longstanding policy of neither confirming nor denying the presence of nuclear arms on its ships, the policy shift effectively closed New Zealand to the U.S. Navy. After the USS Buchanan was denied entry in 1985, security ties between the two treaty allies fell apart. Washington suspended its obligations to New Zealand under the ANZUS pact. Joint military training and exercises ended, New Zealand warships were prohibited from visiting U.S. bases anywhere in the world, and high level visits were curtailed. Some important cooperation endured, including in intelligence and Kiwi participation in the Afghanistan and Iraq wars. But only in the last several years has the dispute’s retreat into history combined with rising security threats to chip away at the broader freeze. Wellington’s defense white paper, issued last month, suggests a primary impetus for the changes. “New Zealand’s relative geographic distance from other countries,” it concludes, “no longer affords the protection it once did.” Cyber threats reach well into the south Pacific, and New Zealand citizens have traveled to Syria to fight with the Islamic State. Wellington is beefing up its cyber defenses and has deployed 140 troops to train Iraqi security forces in their battle against the Islamic State. Then there is the rising concern about threats to the rules-based order that has much of the region on edge. Half of New Zealand’s maritime trade passes through the South China Sea, an obvious concern with Beijing militarizing the area and suggesting that it may declare an air defense identification zone there. The Kiwi defense paper stresses the importance of the claimant states – read China – respecting the final outcomes of dispute settlement institutions. Beijing’s utter dismissal of the recent arbitral trubinal ruling on the South China Sea is bound to rattle nerves. Wellington is reacting to such developments with roughly the same approach favored by most countries in the Indo-Pacific: diversify trade, boost defense capabilities, and strengthen security ties with the United States and countries across the region. New Zealand has been at the forefront of pushing for the Trans-Pacific Partnership (TPP) trade agreement, which it seeks for strategic as well as economic reasons. Its exports to China have tripled since Wellington signed a free trade agreement with Beijing in 2008, and China is now second only to Australia in the amount of exports it absorbs from New Zealand. TPP would provide a domestic economic boost and increase trade with its members, which would together mitigate the Kiwi economic dependence on the Chinese market. At the same time, the government has announced a $14 billion military modernization plan that will unfold over the next 15 years. Its investments will include strategic and tactical airlift capabilities, air surveillance platforms to boost maritime domain awareness, and replacement for the navy’s ANZAC frigates. New Zealand has explicitly welcomed Japan’s moves to play a stepped-up regional security role and, while noting its close ties with Beijing, also emphasized links to Singapore and Malaysia. Deepening security ties with the United States are a natural extension of this approach. Washington will need to be realistic about the scope of the opportunity at hand. New Zealand has a population of just four million, with a defense budget around one percent of GDP and a military force made up of fewer than 15,000 personnel. And yet it is growing more confident in its international role, with a temporary seat on the UN Security Council, an aggressive approach to trade liberalization, and a military engaged in operations as far afield as the Gulf of Aden and Timor-Leste. Banishing the anachronistic nuclear divide is the first step in an enhanced U.S.-New Zealand partnership that might one day see Auckland participating in key overflights or freedom of navigation exercises. It could broaden the scope of U.S.-Australia-New Zealand security cooperation in both the Middle East and the Pacific, and perhaps represent a first step toward the eventual resuscitation of ANZUS. Time will tell. For now, thawing this peculiar form of nuclear freeze is a welcome sign of the times. Richard Fontaine is president of the Center for a New American Security in Washington, D.C. and the inaugural Alliance 21 Fellow at the University of Sydney’s U.S. Studies Centre. On both conventional defense and cybersecurity, New Zealand is trying to "catch up" to existing trends.